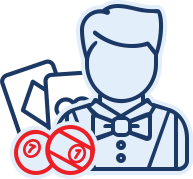 Starting with the cons, it’s important to understand that the use of live dealers is still a relatively new practice in the world of gambling, and it still has some kinks to straighten out. Nothing is perfect after all, but before putting your money on the line you should understand all of the ups and downs of live dealers. The most obvious downside of live casinos is the increased overheads. Compared to entirely virtual casinos, live casinos pay a significantly larger sum of money for things like location, casino equipment, filming equipment, live dealers and the rest of the crew, and those costs tend to come back to you as a customer. Regardless of their platform, a casino is a business, so it isn’t likely that that they would be willing to slash their own profits for the benefit of your pocketbook. Expect these overhead costs to show up in the form of higher minimum stakes and potentially lower payouts. Also, another product of these higher costs is that there are fewer reputable live casinos to choose from and they can only offer a limited number of games with live dealers. So when looking for a live dealer game, expect to find only the basics and fan-favorites: roulette, blackjack, Sic bo, and baccarat. If you need a wide variety and flexibility, you’ll be better off scanning the selection of virtual games offered by online casinos. But if you’re down for a round of blackjack, check out these blackjack myths and then log on and head to the table! A con of live dealers may also be seen as a pro – and that is the live dealers themselves. Playing to the preferences of their largest demographic, live casinos tend to hire young and attractive female dealers. The only way this would go on the con side is that the people who want to watch a beautiful girl deal their cards tend to be the people who get distracted by the beautiful girls who deal their cards. Live dealers who fit this profile are quite aware of what affect they have on others and – forgive the archaic language – aren’t afraid of using their feminine wiles to take advantage of you as a player. If you know that you’re susceptible to straying eyes and a wandering mind, you may find that playing casino games with live dealers will open a black hole in your bankroll. In the end it’s obviously up to you, but if you find your account in the red, this may be a part of the problem. So, instead of being distracted by the pretty girl with the cards at the baccarat table, try to focus on remembering the three bets winning baccarat players stick to in order to keep your bankroll well in the black. This last one is another part-pro, part-con aspect of live casinos. A reason people prefer live dealers to virtually shuffled cards is that they can watch the shuffle. But the people who shuffle cards are human, and humans aren’t infallible. Though this is an unusual occurrence, in February of this year footage came out of a live dealer who fudged the cards he dealt which caused the player he was going against to lose. Specifically, during a game of blackjack, he flicked up the front card in the shoe and picked up the second card to lay out for the player. He then dealt himself that first card, resulting in his winning the game. Like I’ve said before, it is incredibly unusual that such a thing would happen. It’s unwise to say the least, considering a camera is trained directly on the dealers and players don’t have casino surroundings to get lost in. And, honestly, this dealer was nothing close to an attractive female dealer, so his use of womanly wiles to distract was out of the question. But it just goes to show that whereas RNG are simply programs with no stake in the outcome, real people can be corrupted. The same technology that allows computers to scan cards may enable these people to fix the results of the game. It’s always a possibility, so keep it in mind before laying down your life savings or at least remind yourself of it before a game and make sure to watch the dealer’s every move.